A friend has forwarded to me an interesting blog, dated September 28, by Fr Stephen Wang of the Westminster diocese. 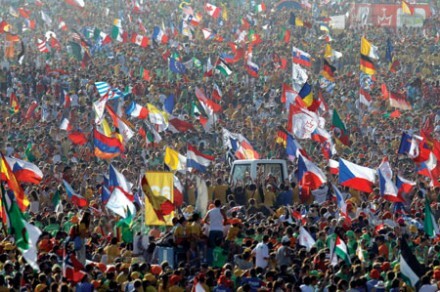 Entitled “Liberal, conservative, progressive, traditionalist: where is the Church going?” it throws open a debate about an article written by John Allen of the National Catholic Reporter at the conclusion to World Youth Day. 1. A strong defence of traditional Catholic identity, meaning attachment to classic markers of Catholic thought (doctrinal orthodoxy) and Catholic practice (liturgical tradition, devotional life, and authority). 2. Robust public proclamation of Catholic teaching, with the accent on Catholicism’s mission ad extra, transforming the culture in light of the Gospel, rather than ad intra, on internal Church reform. 3. Faith seen as a matter of personal choice rather than cultural inheritance, which among other things implies that in a highly secular culture, Catholic identity can never be taken for granted. It always has to be proven, defended and made manifest. Good question. I also agree with John Allen’s analysis and it is what gives me hope for the Church in the future. Growing up as a Catholic in the 1950s and during Vatican II, as I did, was a very different experience. It was a Church of “pray, pay and obey”: unquestioning faith (but little capacity to defend it), the Sunday obligation, no understanding of the Church’s mission (except for the foreign missions and “adopting” black babies in Africa) and one’s Catholic identity entirely taken for granted. Then came Vatican II and this cosy world of Catholic habits and assumptions fell completely apart. This gives the flaw in the Traditionalist argument that everything was fine until we abandoned the Latin Mass. It wasn’t; the Church in England was comfortable, complacent and (in my neck of the woods) a place of bills, bingo and bourgeois respectability. The fervour of the early Christians was nowhere to be seen. Today such an outlook is unthinkable. You have to choose to be a Catholic, with all the commitment to truth this implies. If you don’t make that choice you are already lost to the values of the secular world – which is not just neutral or indifferent to Christianity but deeply hostile to it. Just about every day one is confronted with the choice of putting a pinch of incense on the altars of the secular gods (and thereby having an easy life) – or being marked out as a bigot for standing up for one’s faith. It doesn’t just separate British conservatives from their American counterparts; it completely separates British Catholics from any possibility of identity with Conservatism (or indeed, any of the political parties) over here. Imagine Harold Macmillan (Cameron’s hero, apparently) declaring “I support gay marriage because I’m a Conservative.” Or even Margaret Thatcher. That is the distance the party of “traditional values” has travelled in the last two decades. As John Allen comments, and as Fr Wang agrees, in the morally compromised and fragmented world around them, serious young Catholics today have found the identity they hunger for within the Church. But this is not the pre-Vatican II Church; it is the dynamic, missionary, “evangelical” Church of John Paul II and Benedict XVI.